11 Arab Companies Make Forbes Global 2000 Top Growth Champions List - Africa M.E. The world’s biggest and most powerful companies are ranked yearly by sales, profits, assets, and market value and ranked in the Forbes Global 2000. This year, Forbes worked with database company Statista to look at the compound annual growth rate of revenues, from 2013 to 2016, for all 2000 companies and converted figures into US dollars. 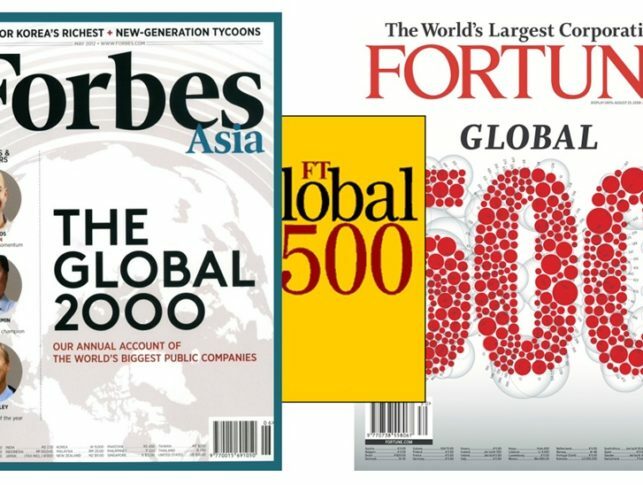 The growth rates were then ranked, and the top 250 companies were listed as the Forbes Global 2000 Top Growth Champions. While no Arab company made it into the top 250 companies that made the Best Employers, Top Regarded Companies, or Top Multinational Performers list, 11 Arab companies did leave their mark on the 250 Top Growth Champions list. Of the 11 companies, five are from Saudi Arabia, four are from the United Arab Emirates, two companies are from Qatar, and one is situated in Lebanon. Heading the Top Growth Champions list is the UAE’s residential and commercial development company, Damac Properties. Situated in Dubai, the luxury real estate company delivers upscale properties across the Middle East and the United Kingdom. As of May 2017, Demac Properties had a market capitalization of $4.7 billion. It had total assets of $6.92 billion, and a gross debt of $1.36 billion. With 55 million square feet of property development in planning or progress, including more than 13,000 hotel rooms and more than 19,000 employees, Demac earned $1.63 billion at the end of Q3 2017, 13% higher than in 2016. With Expo 2020 set to increase demand for real estate in the region, Demac’s performance was attributed to continued demand for its projects. Demac recently reported more than 80% of its hotel apartment projects in New Dubai and Dubai South have sold out. It runs the only Trump brand golf club in the Middle East, and the company has also been chosen by the Oman Government to develop its $1 billion Port Sultan Qaboos waterfront project. Although revenues fell slightly in 2016, the real estate market in the region has stabilized according to Demac’s CFO Adil Taqi, and sales for the first six months of 2017 are up 4% over the same period in 2016. The other Middle Eastern companies that made the list included Saudi owned real estate firm Jabal Omar Development, which ranked number 7. Alinma Bank, also from Saudi Arabia ranked 167th, Alawwal Bank ranked 169th, Saudi Investment Bank ranked 210th, and Saudi Arabian Mining Company came in at 222nd. Other companies from the UAE included real estate and construction firm Emaar Properties, which ranked 208th, and Dubai Islamic Bank, which ranked 249th. Qatar National Bank ranked 96th and Qatari real estate and construction company Ezdan Holding Group ranked 157th. Bank Audi from Lebanon came in at number 155. Ranked second on the list is China’s largest auto distributor China Grand Automotive Services. The Shanghai based company sells more than 50 different brands of cars, including Chrysler and Mercedes-Benz. In 2016, the firm posted revenues of $20.6 billion, 45% higher than the previous year. Also from China is real estate development company, Greenland Holdings, which ranked 3rd, and Hong Kong gaming and real estate firm Melco International, which ranked 4th. Ranking 5th was Chinese delivery service company, S.F Holdings. The top delivering US companies on the list were e-commerce company XPO Logistics, which was ranked 8th and New Residential Investment (13th), Cheniere Energy (21st), Vereit (34th) and Liberty Expeida Holdings, which ranked 34th.